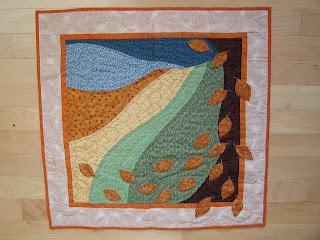 I made this for Linda last Fall, entitled "Fall in Love with Fall". and received this from Luisa. It remains my all time favorite, being hand appliqued, embroidered and quilted. It just flows. I turned around and made this for Luisa pf Portugal for the winter. 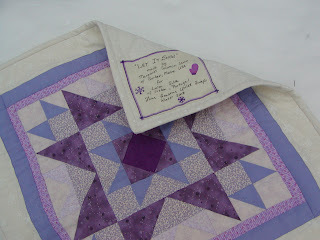 It has a snowflake quilted into the design. "Let it Snow"
For the winter, I received this from Maria, of Brazil. It is more lovely than the picture, entitled Birches in the Snow. I made this for Tami in CA for the spring. It's one of my favorites that I made, all hand embroidered and hand - quilted. "First Blossoms"
I got this from Janice in New Zealand. It's gorgeous raw-edge applique. 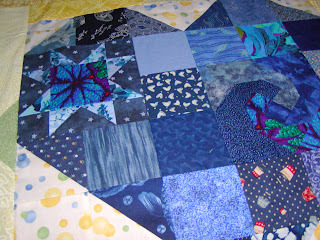 This quilt whet my appetite for trying that techinque om my summer quilt. 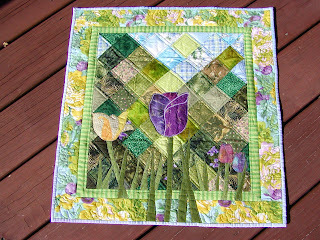 "Spring Tulips"
Here's the summer quilt I made for Ginger in IN. 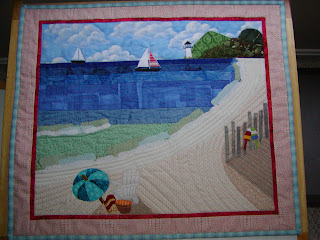 It is raw-edge appliqued, and reminds me so fondly of my home, Maine. I received this "Plant in Full Sun" from Emma of Adelaide Australia for the summer. For the Miniature Booty Swap 1, I made this for Lisa. My partner was a flake and did not make anything. 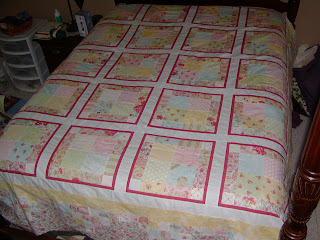 I received the quilt that Jan sent to her (but I dont have a picture of it). This is Lucky the Turtle. I made this for Marlene for Miniature Booty 2. 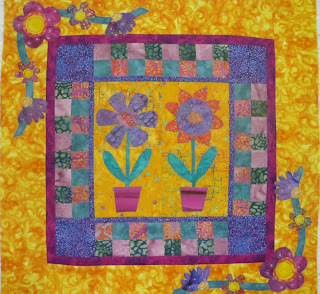 It is hand sewn, appliqued and quilted. I absolutely LOVE this piece! It is named "Stop and Smell the Flowers". I have not yet received my Booty 2 quilt. 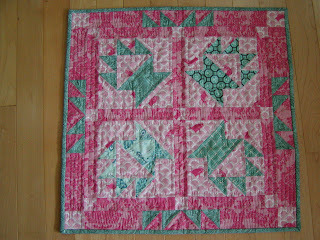 FOr Kate's Another Little Quilt Swap, I made this in May for Lynda of the UK. I called it "Frog in a Blender" because the red and greens. The name may be a little sick and twisted, but I thought it fit the quilt perfectly. It has some fantastic green fabrics Janice sent me from New Zealand. I received this bold lovely from Kate in return. 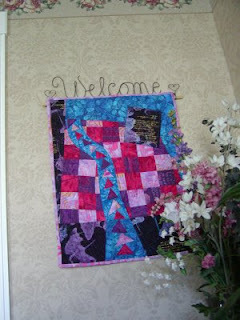 I did the Doll Quilt Swap 3 this past spring. 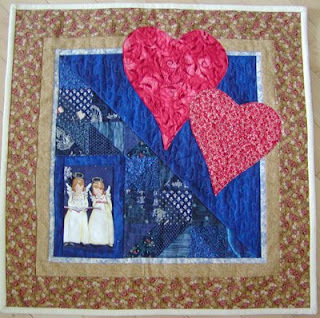 This top was initially pieced for my partner, who has 2 young daughters adopted from Asia...the angels represented them, whereas the red hearts represented China. She bailed from the swap so I finished the quilt for my neice. Though not a swap piece, I finished this for my other neice. The one below is what I actually sent to my partner in the DQS2 - Marianne. It's called "The Lazy Lily". 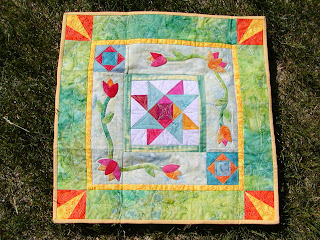 Here's the piece I received for the Spring Fling Round Robin Session 1...made by Julie, Tami, Jeanette and Marisa. 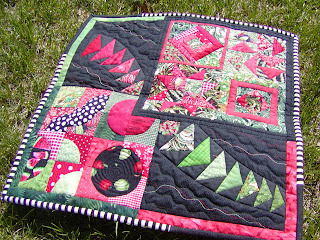 I did the quilting on this quilt in that RR, (also sewn by 3 others) - It went to Dorian. 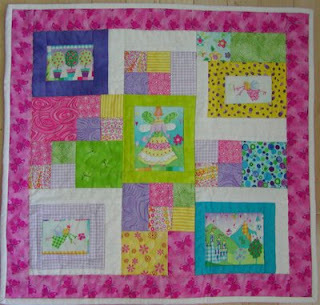 I participated in Ginger's About Forum Doll Quilt Swap also this summer. I made this for Christine in Florida. It is all of 1930's and is hand quilted. I named it "Memories of Summers Past", as it felt very nostalgic and old fashioned. I received this sweet number from Ginger. 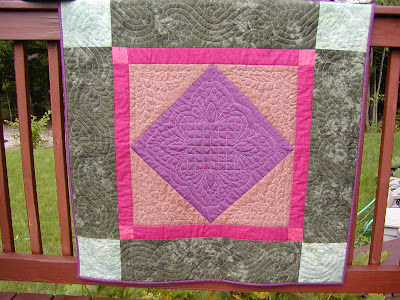 Hand quilted, it graces my daughter's pink bedroom beautifully. Most of these quilts are hung up my stairs, except for Kate's which is in the dining room, Ginger's that is in my daughter's and a couple other's that just are not up yet! I use straight pins in the corners and dbl stick tape to hang. 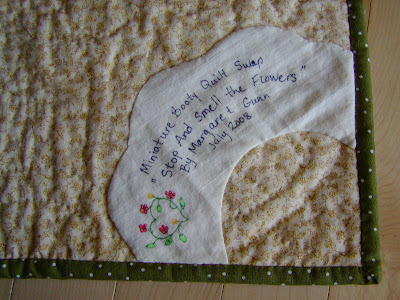 Much to my sadness, my Miniature Booty quilt is packaged up and is heading to the post office today. This is a bit of a bittersweet moment for me, as I really love this little quilt. It is very much my colors and style. Plus it looks great in my house. 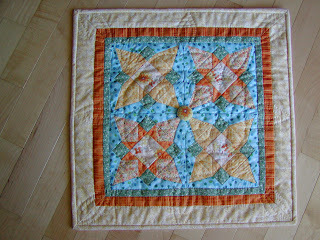 The last quilt I made and really loved was easier to send away because I knew something about my partner, and I felt very connected with the idea that the quilt was being made for her. The same is true about Lucky - I knew it was loved before it was sent. This is unknown territory since the only thing I really know is that my partner likes red, so hopefully she will appreciate it too. 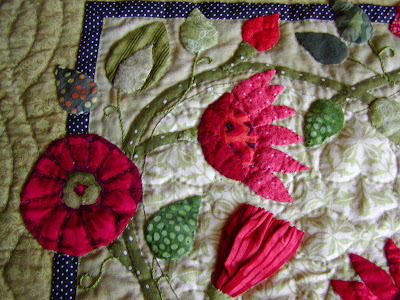 It has an assortment of free-form flowers in many red fabrics - some batiks, some Kaffe Fassett, some oldies-but-goodies (AKA Gramma's fabrics). Same for the leaves. 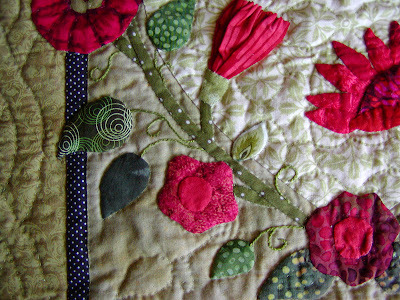 When I look at the flowers and leaves, I am fondly reminded of each of the many projects I made with the materials. 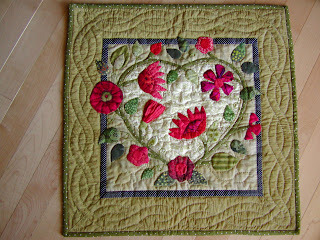 The heart is out of one of my all time favorites - it's from the Moda Dandellion Girl collection. I just love it! 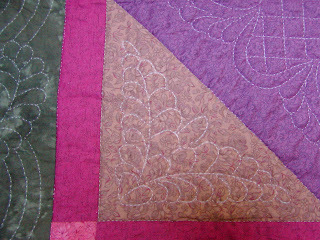 It is all hand needle-turned applique applique and hand quilted. Here's a close up (and blurry!!) shot of a ruched flower. I was trying to utilize the pattern of the red batik. This is the second of my three Legacy quilts. The first one is shown here. The colors are still not true, despite these being taken outdoors under natural cloud-light. 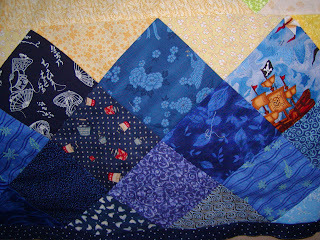 You get the idea though...a modern twist on the Amish style quilt. 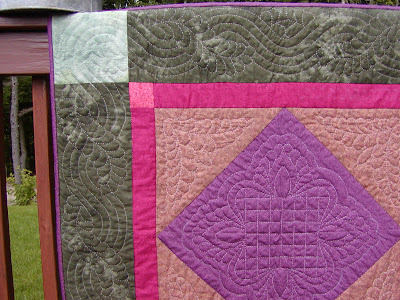 The green and purple materials were also in the first Legacy quilt. 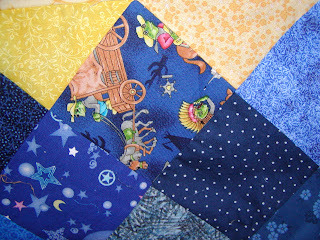 The idea is that there are some common fabrics between the three quilts, even though the designs are vastly different. This depicts the characteristics of my three children, who are the end recipients of these three quilts...same genes, different personality. And, is this not just the cutest little girl???! She's my baby and is turning two tomorrow. Oh, how the time flies. She's the sweetest little girl. 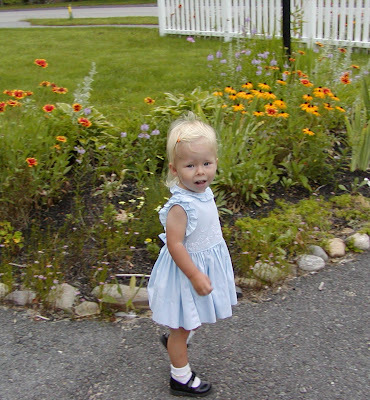 And she's pretty adorable in that dress which I wore 40 years ago. With my oldest starting back to school in 2 days, it's been a hectic week/weekend. Not too much sewing time. Plus, I have been unfocused and unmotivated. I did get two of my Forum birthday swap blocks done this weekend. I think that they are either October or November blocks. Now I can think more about getting my Summer quilt borders done and a couple Linus blankets prepared for a Blanket Day at the end of September. 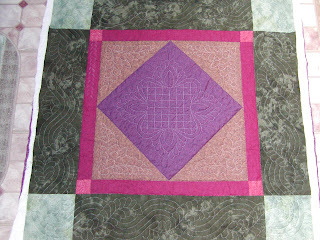 After staring at this all week (center block from Sharon), I opted to do a more simple inner border. Perhaps I am feeling tired, but I did lack on inspiration. Thankfully the lovely Bleaker Street fabrics that she used were in my stash also so I was able to sew without a trip to the store! The end effect, though simple, is very nice. Any guesses on which fabric is coming your way with this?!! My two bed quilt tops are finished, for better or worse. There are certainly things I might do differencly, but having them done is much better than having better ideas and bags full of quilt top pieces. This one looks a little funny on my bed, as it is high and the quilt appears to be short because of the wood footboards on the bed. It is a reasonable length, I assure you. Normally I'd design a quilt for shams, but this pattern yielded a longer top than width ratio so I opted to make it go over the pillows. Thanks to Ms. Paisley & Polkadots (AKA Ginger) for tipping me off to an Amish hand quilting service. I have used a machine quilter that is local to me twice and I have somewhat mixed feelings about her. Her work is decent quality, I just have not been thrilled with her creativity. Maybe she needs more guidance on patterns, etc. I think my ambivalence also is in part to my love of hand quilting. 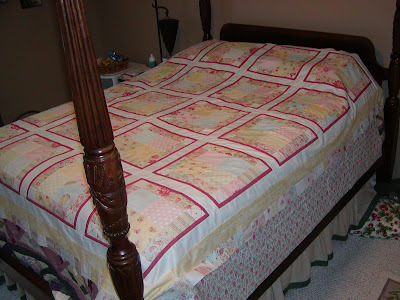 The quilt on my bed is hand quilted, and I spent 4 years finishing it! It's about another $100-200 to have it hand quilted, but it will be worth it. 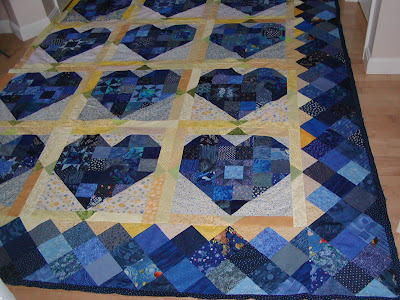 This blue heart quilt will be sent to be hand quilted this week. It makes me very nervous mailing away my hard work, but this service does come well recommended. 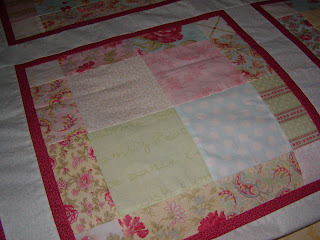 Because this quilt is scrappy, I was able to use hundreds of different fabrics. Here's one of my more unusual ones (the western wagon-pulling frogs!). I know that the recipient will get a kick out of my hidden humor. There's also some nice Asian parasol girls, and my son's favorite - a pirate ship! And also some more lovely Kaffe Fassett geranium leaves and Foxgloves in blue. Together, it is all very lovely, and interesting. It keeps the eye traveling from heart to heart. It is completed, and for someone who does actually like pastels, it will make a nice gift. The borders are rather simple. Come to think of it, the majority of the quilt is simple - 5 charm packs sewn into 20 9-patches, then sliced into disappearing nine-patches, bordered, sashed, and voila...quilt top! 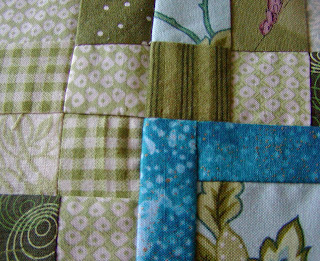 Anyhow...the remaining charm squares were cut into the 2" stones I used on the border. 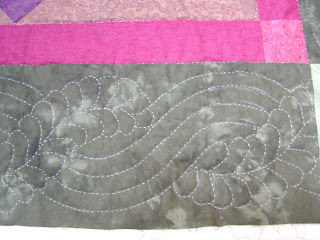 I will have it finished with a scalloped edge, and maybe bound in the rose. 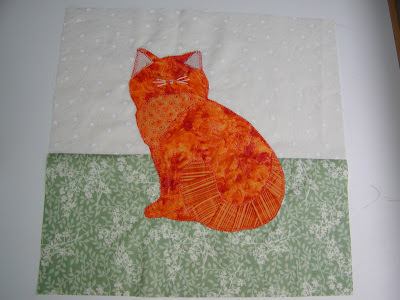 This one is going to the machine quilter I use. 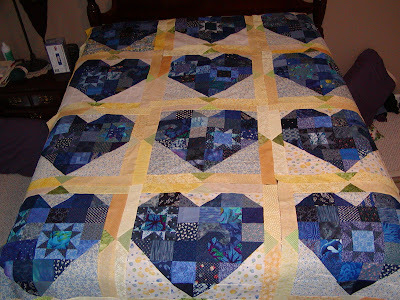 I plan to have her quilt a feathered heart into each square, and do some scalloped feathers around the border. That is MY plan anyhow! I don't know if you can read the fabric or not, but there's one fabric in this set (in each color) that has words on it... "love", "family", "hope", "peace", "dance", "wish", "celebrate"...just to name a few. I just love this. - added 1st border to my round robin piece, after deliberating on this all week. It was a real challenge for me. 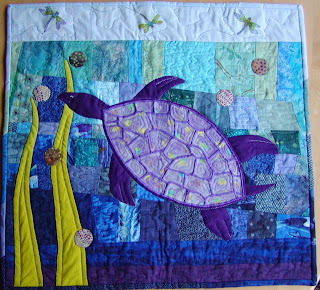 - bound the second of my Legacy quilts. Small details until it is completely finished. Plant In Full Sun arrived sometime last week while we were away on vacation. 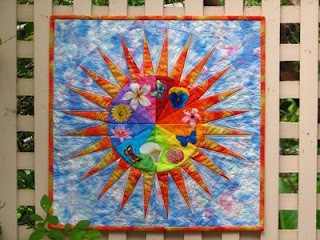 This bright and cheery addition to my 4-Seasons collection of minis was made by Emma of Adelaide, Australia. She is a masterful piecer and machine quilter. I have returned to about 300 emails to sift through, many about 4SQS and SFRR2 mailings. I am getting there so be patient. 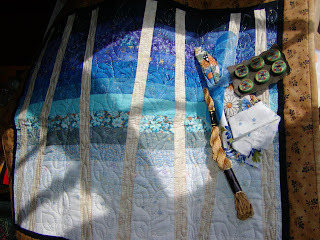 I was finishing the quilting of this piece, one of my three Legacy quilts. It is now ready for binding and removal of the chalk lines. I will take better pictures when it is finished, as these are awful, I know. I have 2 weeks before I go back to work, and 1.5 weeks before my oldest starts 1st grade. Both of these will diminish my sewing time significantly. As a result, this week I am tasking myself to finish the borders on the Simplicity quilt (1 down, 1 in pieces, and 1 to do). 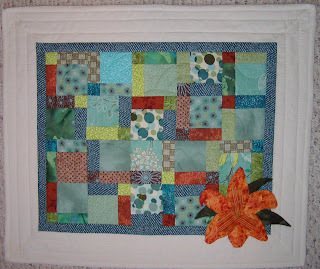 I have drafted a design for my ALQS quilt in hopes of getting it started early. I know I told myself I would not do this swap, but what can I say... I am a sucker :-) I think I have a SFRR2 center in my mail that I will have to add a border to in the next month as well. I will however be away for a few days to what looks like it will be damp, rainy, flood infested upper Vermont. With all the 80s and 90s we had in June and early July, it might not break 70 next week. How frustrating since we have a house on the shores of Lake Champlain for a week. I may drag the sewing machine along anyway!! I found this today...for all of you interested in origami flowers, but not wanting to buy a book. Last border is on and it is not yet 8am. There's progress! I need to toss it onto the bed and check it for size before I trim off the excess border and call it good as done (& ready for long armer). I can now say that I do love the way this one turned out, despite some doubts I had along the way, and I know that the recipient will too. Many thanks to Amy, Solidia and Julie who contributed scraps for this project also!! All of your variety of fabrics made it work. Thanks too for all the wonderful comments about this. They may go unmentioned most days, but they mean a lot to read. Now to get ready for the MIL's visit and plan what needs to be done for the 2nd quilty project I will conquer at naptime today. Though I have a few things to fix here and there (ie., couple chopped off triangle points, little extra unexpected length, etc. ), two of this quilt's borders are on! 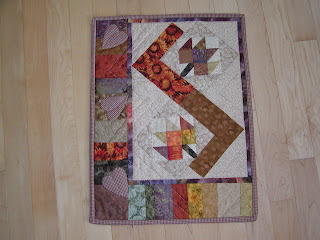 The third border is all pieced together. I need to square and even up all of it's edges, and it will get attached tomorrow morning. I think I am happy with how the scrappy blues are looking on the border. I will likely do a scrappy blue binding too. Later today I will put it onto the bed to see if the sides have adequate drop, but I think they are fine. The last week or so I feel like I have been asleep behind the blogging wheel. I am behind in my personal projects and have felt the stress from that more (despite having my bday block swap blocks done for the next 2 months, and my Miniature Booty quilt finished as well). I have 3 queen size bed quilts in the works, and none is ready for the LA quilter. So rather than pull out what I really needed to work on (AKA those dreaded quilts), I pulled out my flannel scraps and whipped up a couple relatively simple flannel quilts for Project Linus. These make quilt numbers 9 and 10 for me to bring to a drop off in early October, for which I will receive 3 fat quarters for each quilt. That alone is a great motivator for me to finish another 3 or 4 before then! I'll get pictures up soon. 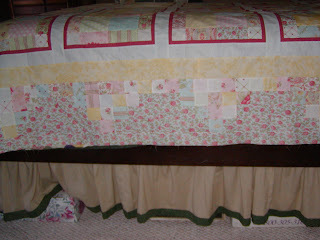 I staged 2 of my bed quilts this weekend on my bed. 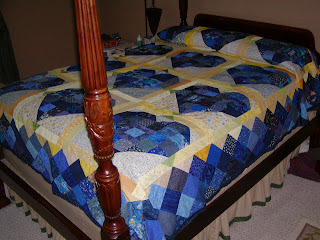 Until Sunday, they were still in too many pictures to put onto the bed and get a good visual of the quilt. 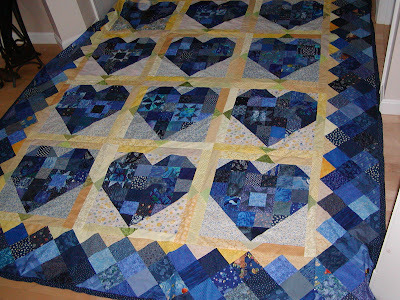 This past weekend I also sewed the 12 22" heart blocks together so I could get a good look at this quilt. I was very close to making these into 2 Linus quilts, but with my ambivalence with the Simplicity quilt, I have a reformed love for these blocks, and feel like the initial recipient of these would relate and appreciate this quilt more than the Simplicity. Further, I have another person in mind for Simplicity, who's style is really much more in line with those fabrics. So, with that ambiguity (grins!!) as they may be reading this before Christmas, I'll stop my blathering. My plan for the hearts??... Add an 11" border. At first I designed up one, and fortunately (and much unlike myself), I made just one of the 14 blocks up last Saturday. I did NOT like it. I was much relieved there was not all 14 before I decided that too! 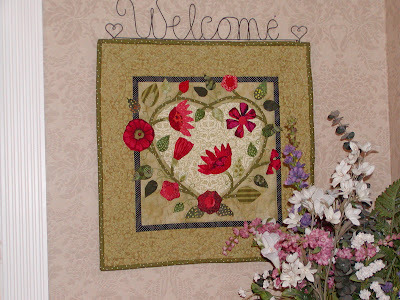 The consensus was that it was not scrappy enough to blend nicely with the scrappy hearts. So I made a small modification and the borders are scrappy like the hearts. Pictures soon, promise. Unfortunately, I used all of my bolder Kaffe Fasset scraps (ones with turquoise), so border does not have those small "punches" of color. It will still look good. And, more importantly, this top will be completed before we depart this weekend. I have 2 of the 3 borders sewn and awaiting squaring and trimming before I attach them to the top. That's progress I can be proud of! 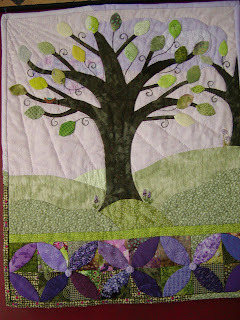 One last little show...Here's Nell's pet block for Kate's bday block swap. It went into the mail today. Every house ought to have a fat orange cat. I already posted a picture of Anne's mariner's compass. Oh and a glimpse of what I am sending to someone tomorrow...the center (part of the center) block for the Spring Fling Round Robin 2. 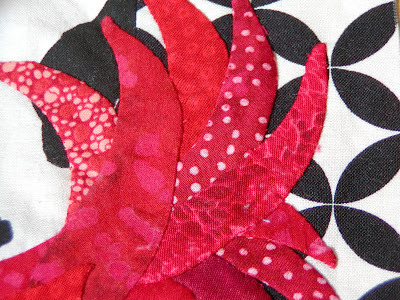 In case you are reading and wondering...the fabric I sent with it is the red dotted batik! I call it "Lollalilou", because it reminds me of something out of Dr. Seuss and I think he had a creature named that!